Ryanair, Europe’s No.1 airline, today (27 Sept) announced significant expansion in France, launching 2 new bases at Bordeaux and Marseille as part of its Summer 2019 schedule, with 2 new based aircraft for each airport (a total investment of $400m) and 27 new routes (connecting 12 countries), which will deliver a total of 3.5m customers p.a. across both airports. – 825* “on-site” jobs p.a. – 1,800* “on-site” jobs p.a. French consumers and visitors can now book flights as far out as October 2019 on the lowest fares. To celebrate the launch of its new Bordeaux and Marseille bases, Ryanair has launched a seat sale with fares on its new Bordeaux and Marseille routes available from just €24.99, for travel in April, which must be booked by midnight Monday (1 Oct) only on the Ryanair.com website. “We are pleased to open two new French bases in Bordeaux and Marseille, as we base 4 aircraft and invest $400m at the airports. Our growth will deliver 1.1m customers p.a. 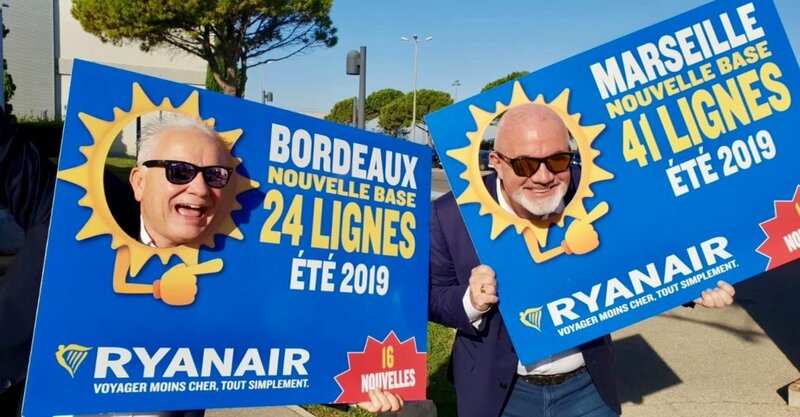 at Bordeaux Airport and 2.4m customers at Marseille Aiport, while creating 120 Ryanair jobs across both bases and supporting over 2,500* ancillary jobs in the regions.